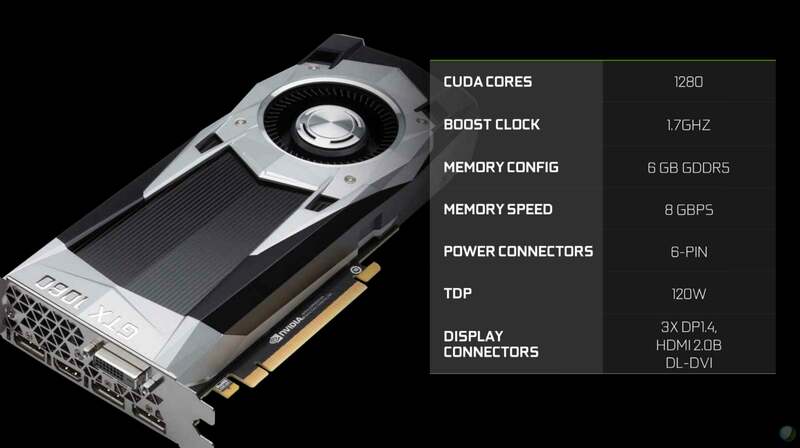 Nvidia's GeForce GTX 1060 promises to deliver GTX 980-level performance for just $250. Here's a look at the card from every angle. On Wednesday, Nvidia revealed its rival to AMD’s wonderfully powerful, deliciously cheap Radeon RX 480: the GeForce GTX 1060. This beast costs a mere $250 (or $300 for the pictured Nvidia Founders Edition), but Nvidia claims it’ll outpunch a GTX 980 in a performance slugfest. Hot damn. The GTX 1060 won’t be available until July 19, in both reference and custom versions, but as with the Radeon RX 480, we wanted to give you a glimpse of Nvidia’s imminent new sweet-spot graphics card from every angle, to see what we can learn from the design. Fooled you! 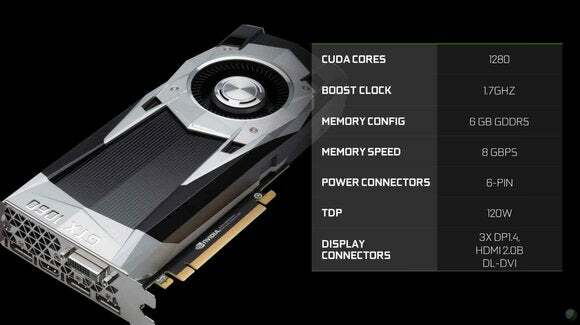 Before we dive in, here’s a high-level look at the graphics card’s tech specs. For even more details, be sure to check out PCWorld’s deeper GeForce GTX 1060 preview. 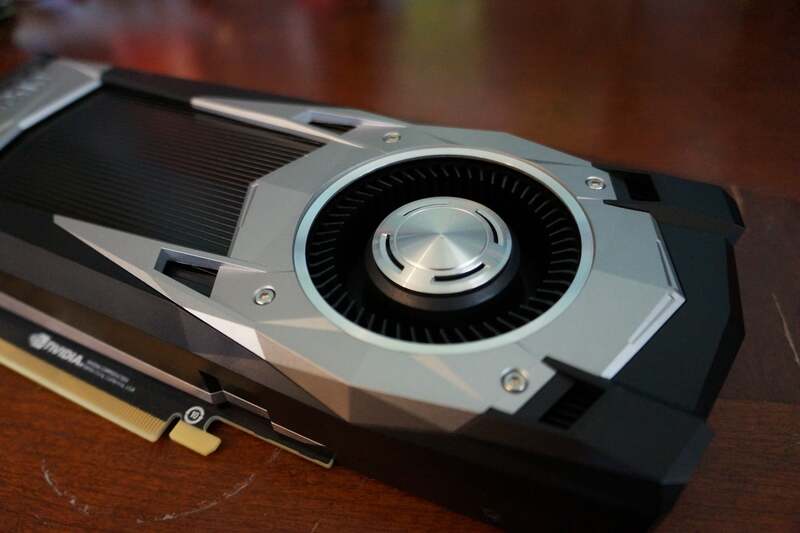 The visual design of the GTX 1060 mimics the overall aesthetic of the angular GTX 1070 and GTX 1080, but with more black overtones throughout the shroud—a logical design decision in a mainstream card. And is it just me, or does the bit of silver remaining on the card’s top look awfully similar to the Millennium Falcon? Just saying. Told you it looked similar to the GTX 1070! 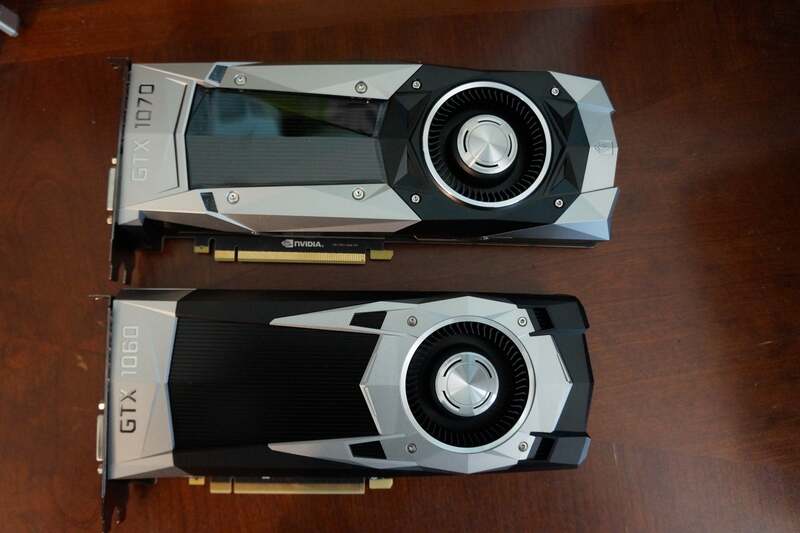 In addition to reversing the color scheme, the GTX 1060 is a tiny bit shorter than the GTX 1070. Like virtually every reference card in recent memory, the GeForce GTX 1060 uses a blower-style fan that blasts heat out of your PC via the rear I/O panel, rather than exhausting all that hot air down into your system. 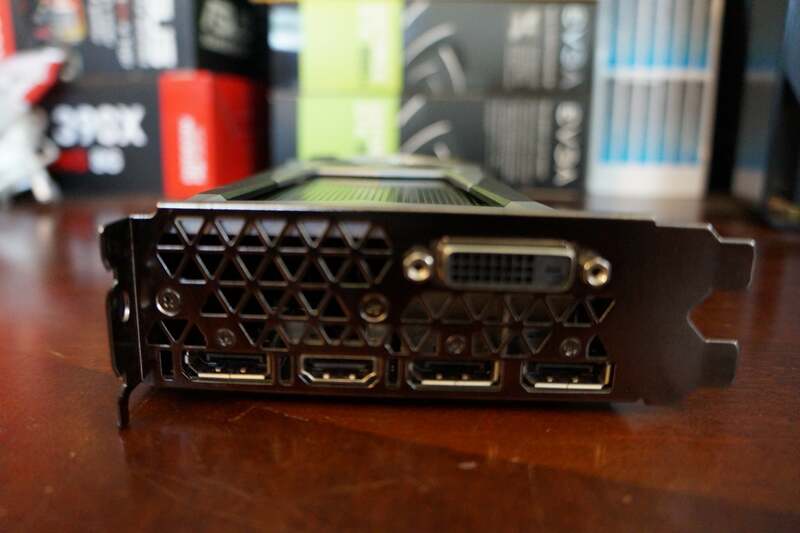 Speaking of the rear I/O panel, the GeForce GTX 1060’s mirrors its GTX 10-series brethren with a DVI-D port, an HDMI 2.0b port, and a trio of DisplayPort 1.4 connections. 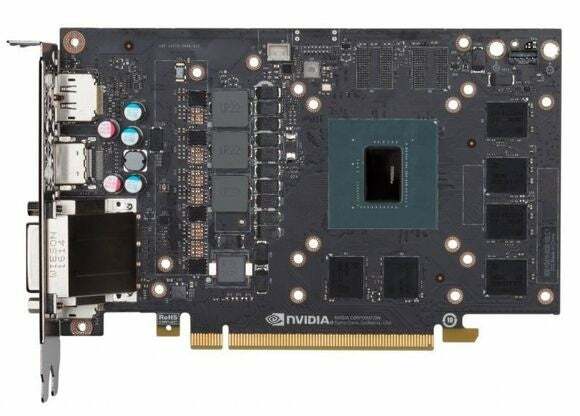 The card supports high-dynamic-range video, virtual reality headsets, ridonkulously high monitor resolutions—heck, basically anything you want to throw at it. 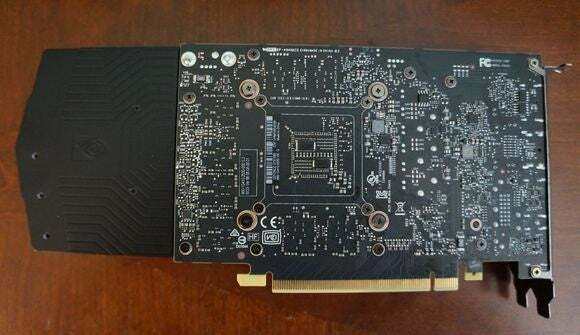 Flipping the card around, the end of the GTX 1060 has a cutout in the shroud that reveals the heatsink underneath. 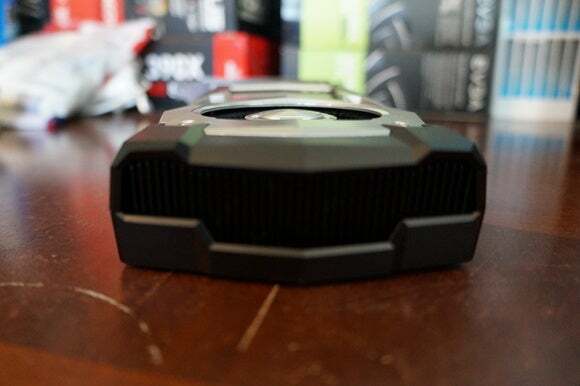 By contrast, the Radeon RX 480’s backend features a solid construction. One edge of the GTX 1060 is notable for what it doesn’t have: SLI connectors. 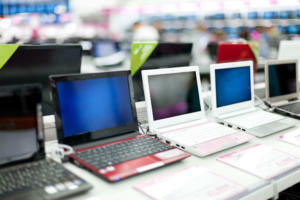 Nvidia says that’s because its SLI efforts are focused on high-end systems and nobody SLIs midrange GPUs anyway. 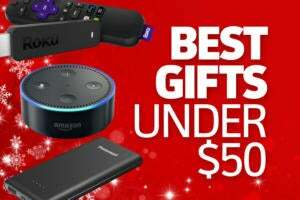 I’d wager that the real reason is because Nvidia doesn’t want people picking up a pair of these for $500 and going toe-to-toe with the $600-plus GTX 1080. 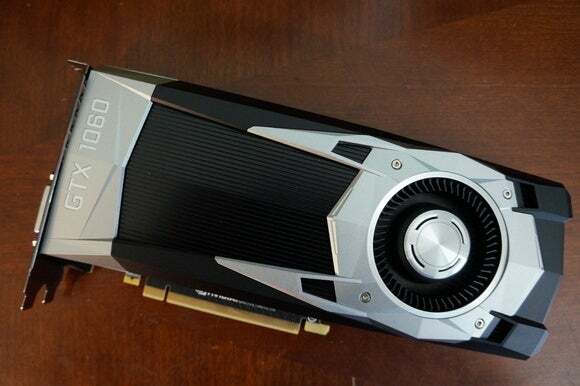 The older GTX 960 supported SLI, after all, and it only cost $200 at launch. Whatever the case may be, I’d rather Nvidia make a card this powerful available for $250 and ditch SLI than jack the price and support SLI. If multi-GPU is important to you, the Radeon RX 480 supports up to 4-way CrossFire setups. The GTX 1060’s sole 6-pin power connector sits at the opposite end of the card’s edge. 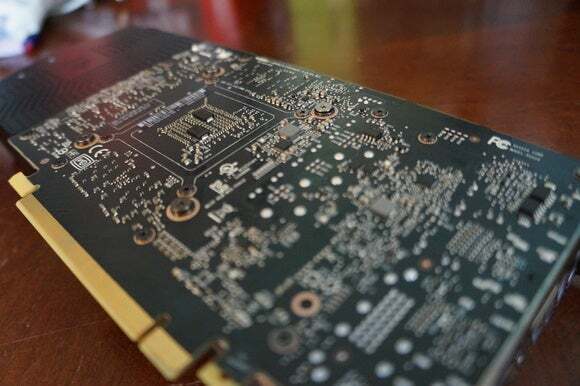 AMD’s RX 480 also uses a 6-pin power connector, and it’s been embroiled in power consumption controversy, but don’t expect to see something similar with the GTX 1060. 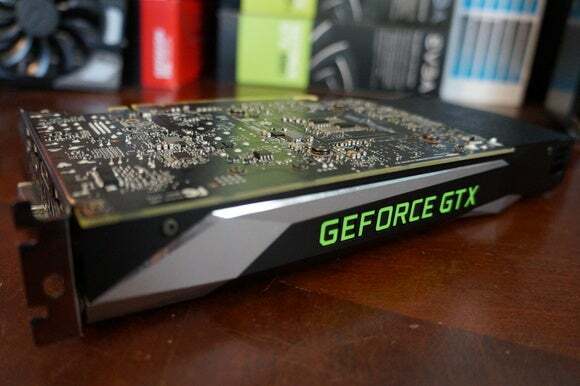 Going off the performance of the GTX 1070 and GTX 1080, Nvidia’s new Pascal GPU appears much more power efficient than the Polaris GPU inside the RX 480, which basically manages to equal last-generation’s GTX 970. 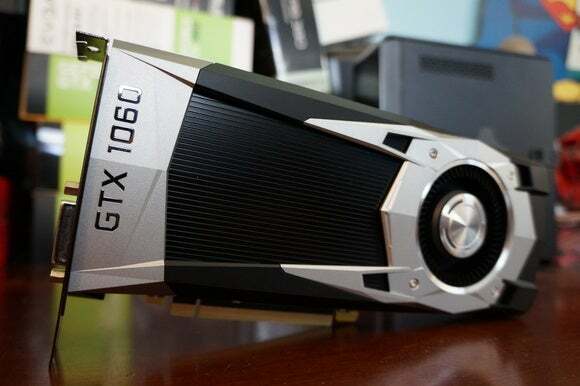 Nvidia’s rated the GTX 1060 with a paltry 120-watt TDP. Flipping the GTX 1060 over reveals something interesting: Its circuit board is just as puny as the Radeon RX 480’s, at about 7-inches long. 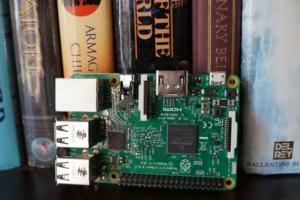 That’s barely longer than the Radeon Nano, which has the extra space-saving advantage of high-bandwidth memory. 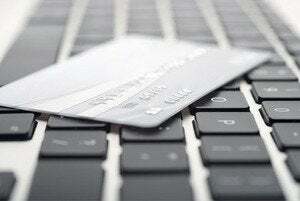 The rest of the card’s length is devoted to cooling technology alone. 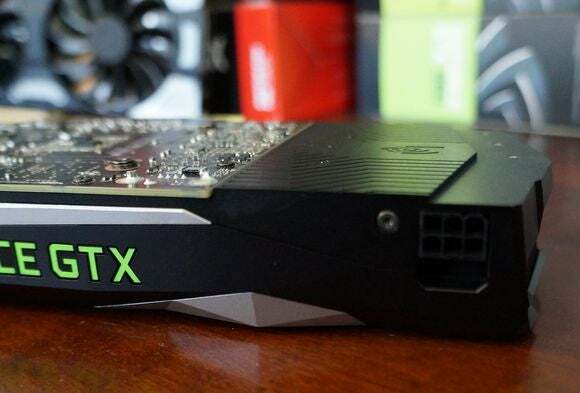 Moving to smaller GPU technology after four long years on the 28nm process has clearly paid dividends for both AMD and Nvidia. Compared to the GTX 1080 and GTX 1070, this mainstream card lacks a backplate—but what do you expect for $250? Here’s a gratuitous close up of the back of the GTX 1060’s PCB, for you graphics card nerds out there. And if you’re a graphics card geek, here’s the real money shot: The GTX 1060’s bare PCB, with its 6GB of memory and 16nm FinFET “Pascal” GPU on full display. This card uses a new GP106 processor, rather than a cut-down version of the GP104 found in its more potent cousins. Again, for more tech spec info be sure to check out our deeper GeForce GTX 1060 preview. And yes, eagle-eyed observers, this is an Nvidia-supplied picture of the PCB. I haven’t finished testing our review sample yet so you’re nuts if you think I’m ripping it apart.